Last year, EID highlighted the fact that several recent peer-reviewed studies have concluded microbial sources of methane such as wetlands, agriculture and rice paddies are responsible for the increase in global emissions since 2007 — not oil and natural gas production. As the following NOAA graphic illustrates, the amount of carbon-13 detected (lighter colored lines) started to fall in 2007 while overall methane levels (darker colored lines) increased in each of the four latitude zones NOAA collected air samples from. 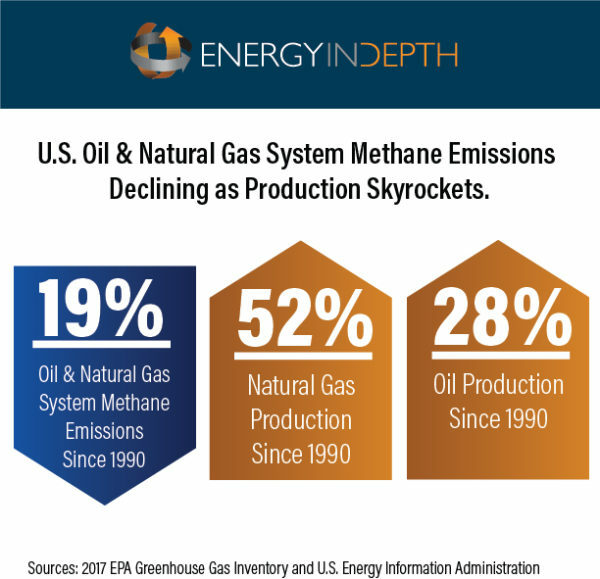 “The post-2007 uptick in global methane levels roughly coincides with the rapid deployment of natural gas ‘fracking’ in the United States, making fugitive emissions a logical suspect. But attempts to verify the connection have produced counter-intuitive results, according to Stefan Schwietzke, a methane expert from the Cooperative Institute for Research in Environmental Sciences (a NOAA-University of Colorado Boulder partnership). “Schwietzke’s research suggests that methane emissions from fossil fuels are higher than countries’ self-reported inventories suggest, and they may even be increasing. And yet, he explained via email, methane derived from fossil fuels is enriched with carbon-13 — a rare, heavy isotope of carbon — and air samples show that the amount of carbon-13-flavored methane is dropping worldwide. 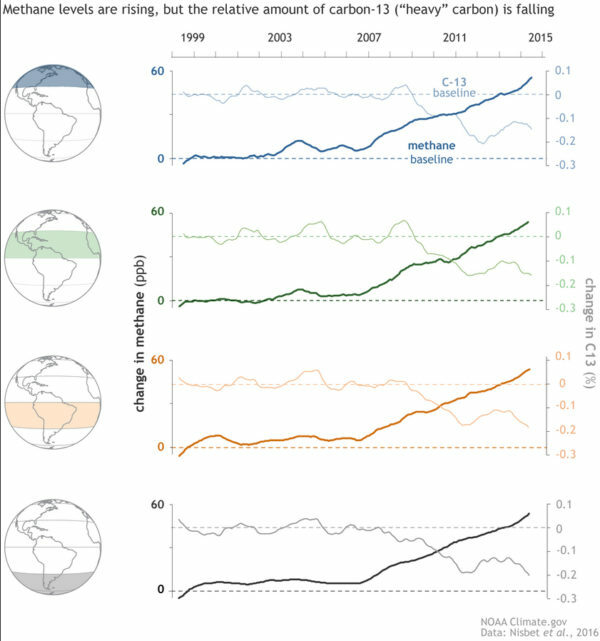 This conclusion is supported by the latest U.S. EPA Greenhouse Gas Inventory, which shows methane emissions from oil and natural gas systems have decreased 19 percent since 1990 (249 million metric tons to 202 mmt) at the same time natural gas production has increased 52 percent and oil production has increased 28 percent. Several recent studies (see below) also support the data presented in the following NOAA graphic showing agriculture and wetlands are a larger source of global methane than fossil fuel production and use. 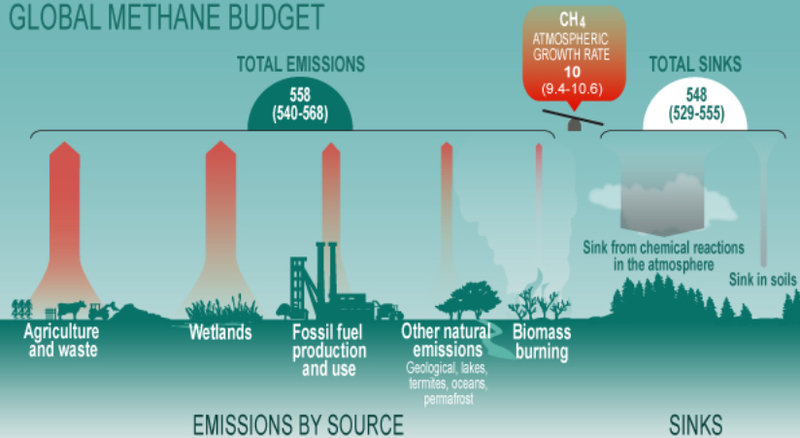 Department of Earth Sciences at Royal Holloway, University of London Study: This study found the spike in global methane emissions since 2007 has been “largely driven” by tropical wetlands and agriculture. Using measurements made by NOAA’s Cooperative Global Air Sampling Network in three locations (the Canadian Artic, the south Atlantic and South Africa), a combination of latitudinal analysis and isotopic data led researchers to determine a majority of the methane increase since 2007 has a biogenic signature, meaning it cannot be attributed to thermogenic methane from oil and gas development. The study further notes that the tropical wetlands are responsible for as much as a quarter of global methane emissions, and that significant weather events — such as La Nina in 2007 and 2008 — could explain a nearly 50 percent hike in methane emissions when compared to the last half decade. Furthermore, NOAA’s statement that “carbon dioxide is the 800-pound gorilla” when it comes to global warming because “it’s the most abundant of the long-lived greenhouse gases that human activities generate” is also worth emphasizing, considering the Energy Information Administration (EIA) credits 62 percent of the total 12 percent of U.S. CO2 reductions from 2005 levels to increased natural gas use. All these facts considered, the science is clear: methane emissions from oil and natural gas development are not driving the global increase in emissions observed since 2007, and are actually declining as production remains near record levels. 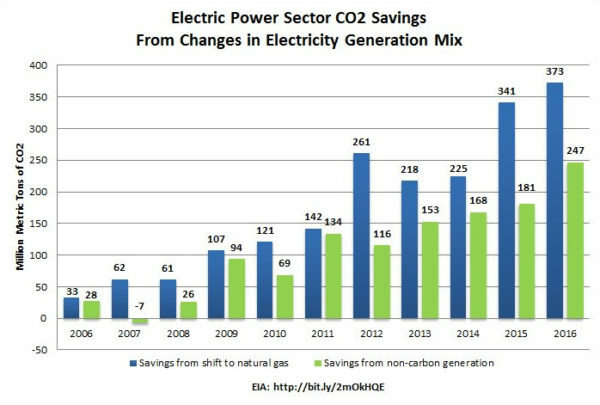 Furthermore, increased natural gas use is responsible for a vast majority of U.S reductions of carbon dioxide — the greenhouse gas NOAA considers the “800-pound gorilla” in the fight to combat climate change. So why do environmentalists continue to make methane emissions from oil and natural gas systems — specifically costly regulations that would reduce global temperatures a mere 0.0047 degrees Celsius by the year 2100 — a focal point of the climate change debate? It is becoming more and more evident that this campaign is driven more by politics and ideology than science.